Vitamin D is one of the most important vitamins needed by our bodies to maintain optimum health. Vitamin D is one of the most important vitamins needed by our bodies to maintain optimum health. It facilitates calcium absorption in our stomachs, modulates cell growth, regulates our mood and much more. When we are deficient in vitamin D, we often begin to suffer from bone pain, muscle weakness, cardiovascular conditions, low moods and countless other health conditions. Since human skin cells are able to manufacture vitamin D using certain wavelengths of ultraviolet B light, sunlight will always remain the greatest source of this essential vitamin. In fact, experts estimate that our bodies can create between 10,000 and 20,000 international units of vitamin D after only 30 minutes of full-body sunbathing, which greatly exceeds an adult’s recommended daily intake (RDI) of 600 international units. Cod liver oil — Cod liver oil, which is the essential oil extracted from the livers of Atlantic cod, is the world’s greatest dietary source of vitamin D. Just one tablespoon of this gold-colored oil, which is often consumed in capsule form to hide its unpleasant taste, supplies our bodies with 1,400 international units of vitamin D, or 233 percent of our RDI. 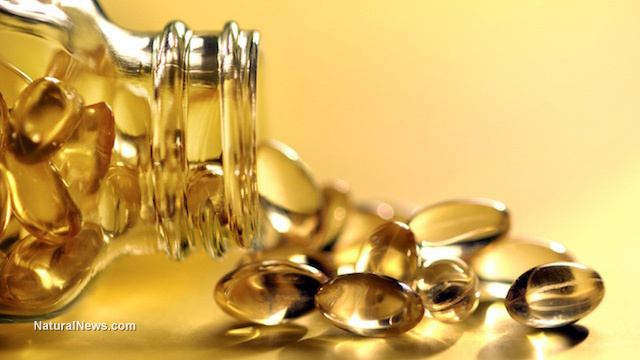 This might help explain why so many studies have linked regular cod liver oil consumption to the treatment of osteoporosis, arthritis and other serious bone diseases. Oily fish — Unsurprisingly, fish that contain large amounts of oil are also good sources of vitamin D. This is especially true of salmon, swordfish and trout, which provide us with between 86 and 97 percent of our RDI of vitamin D per three ounces. In second place is smoked white fish and mackerel, which contain at least 50 percent of our RDI of vitamin D per three ounces. Tuna, halibut, herring, sardines, rockfish, sole and flounder also contain high amounts of vitamin D.
For obvious reasons, it is important to source our fish carefully. Fish from the Atlantic Ocean tend to be less contaminated than fish from the Pacific Ocean, while sustainably farmed fish almost always contains fewer toxins than unsustainably farmed fish. Mushrooms — A lot of people are surprised to learn that many edible mushrooms are packed with vitamin D, but it’s true. This is because mushrooms naturally produce vitamin D when they are exposed to sources of UV light — something that happens quite often, since mushrooms are usually exposed to the elements. Maitake mushrooms seem to be the king of vitamin D, with one average-sized mushroom containing around 131 percent of it. Morel, shiitake and chanterelle mushrooms are also excellent sources of vitamin D, providing us with almost a quarter of our RDI per mushroom. Other sources — After fish and mushrooms, the number of natural foods that contain adequate amounts of vitamin D drop considerably. Perhaps the third best food source of the vitamin is eggs, which contain around 10 percent of our RDI (mostly concentrated in the yolk). Tofu, raw milk and beef also contain small amounts of vitamin D, but nowhere near enough to satisfy our daily requirements.